View Poll Results: Which Candidate Is More Patriotic? Last edited by RAPTOR760; 10-31-2008 at 05:36 AM..
"Of the people, by the people, and for the people"
Since when did loving the country you're from become fascism or does that only apply if the country you love is USA? I think Obama is more dedicated to America and has worked through the average American's process of life. McCain like Bush was born with a silver foot in his mouth.His father scored his position in the military for him and unfortunately for him he ended up a POW which he has tried to ride that fact for sympathy,money and votes nearly every since.I see McCain being dedicated to McCain only.I do give him props for at least showing up to do his duty which is more than you can say for most repukes in the gooberment now. Obama pulled himself up by his own bootstraps. 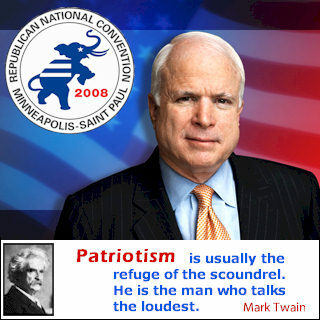 McCain is a service brat, born into wealth and influence.